Sewing Like Mad: It is all in the details - another Japanese pattern. It is all in the details - another Japanese pattern. If you hate Japanese patterns you should probably stay away from my blog for a while because, well here is the second one and the third is already done too...just waiting for the model to be ready to be photographed in it...and the blogger to write the post about it! Like I said on my Facebook page....I am officially obsessed with Japanese patterns. They challenge me without being directly difficult. Now take a look at this top for instance...I mean how insanely cute is that?! 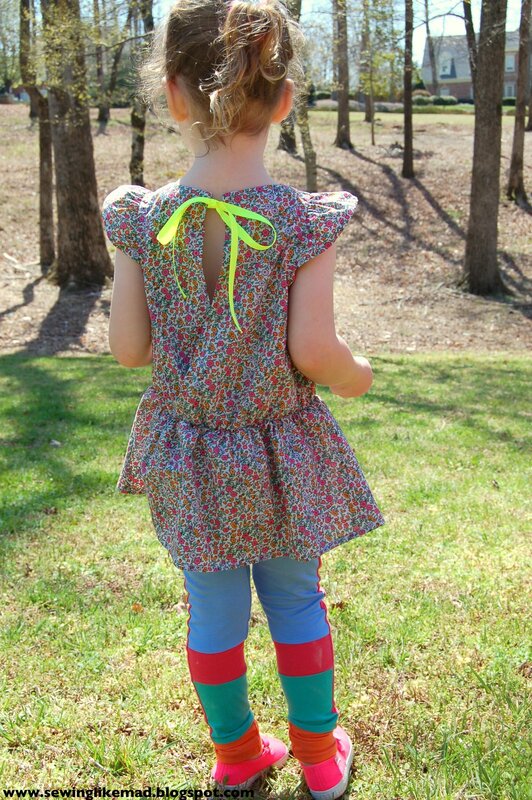 With the little ruffle wings sleeves and not to mention the cross over open back that is still very child appropriate. The top is cut at the waist and both top and bottom part are gathered but the model is still very loose. It was actually too loose for my taste. The technical drawing in the book told me to gather the waist seam on each (front and back) piece to 37 cm (74 cm/29.1 in. all the way around) but when I tried it on E (after it was totally done incl french seams and all the gathering threads was taken out - ahhhhhhh) is was just too wide. So I simply took a narrow elastic, measured it on E to my desired width (68 cm/26.8 in. all the way around), devided the elastic and the waist seam in 4 and sewed it directly on the outside of the french seam. It was not much it took but the result was MUCH better! See a better photo where she is standing up further down in the post. This is the book it is from. 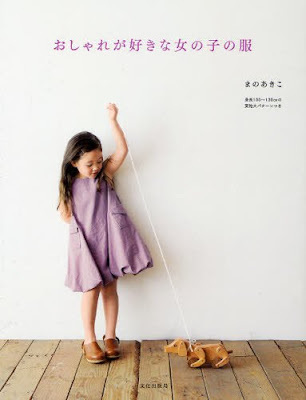 This one does not have a English title written on it but Amazon said this: Japanese Craft book. Girl's clothing #2890. By Akiko Mano. If I should compare the two books I have (see the other one HERE) then I would say that this one is styled quite oldfashioned. The photo on the front is actually not a very good representation for the rest of the book. I am just talking inspiration wise because the patterns/models themselves are just as great as the other book. Most of the clothes is sewed in linen and the colors are grey, beige and white with a few exceptions. I know many people will find that fabric and those colors the exact reason to buy it but it is just not my style. BUT I do have my imagination to see the styles in other fabrics so it is really not a problem. The third item I have made is by the way the dress on the front you can see above, in a fabric Wilma has been coming back to and pulling out of my stash many many times. Now she finally got her dress in it and she is very happy. You will soon see for yourselves. Time to press that Bloglovin button (see right column) so you don't miss it, right! When we are talking details you know I am obsessed with making things just as nice on the inside as on the outside so I put a neon orange bias tape on the edge of the neck facing and on the inside of the sleeve opening. And, like I already mentioned earlier, the whole top is sewed with french seams. There is pattern info to make the tie band but I decided that a neon yellow grosgrain ribbon would be absolutely perfect. Again a nice little detail. So beautiful - I love the neon ribbon! I own the same book, but haven't tried this pattern. Seems like I should! very pretty. Good work Momma! I love this look...simple, yet eye catching. Looks like I should check out this book. I have the same book (but the french edition) and I've already bought the fabric to make the exact same blouse for my daughters. 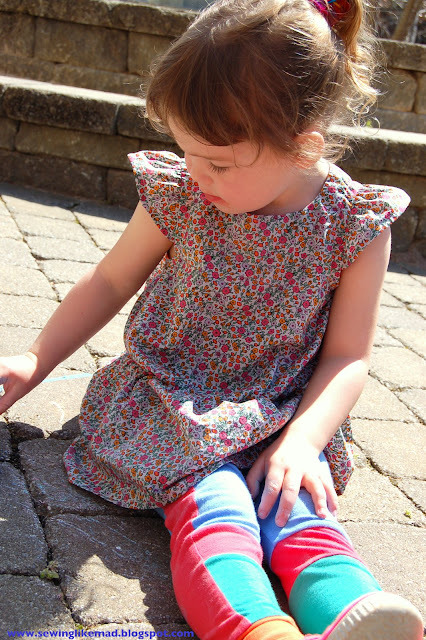 I'm following you from the Sunday linky party - that is such a lovely dress! This is such a pretty dress/tunic. Great job. Thanks for linking up. The little flutter sleeves are so cute, MIe! I think this is the cutest little girls top I have ever seen! Nice work! I love it! Pretty and flows so nicely! Love those tights too!